Originally uploaded by Handmade Nation! So..for the past 24 hours i have been crossing my fingers, my toes, my ears.....? Alas, i can share my news!! IM GOING TO BE IN THE RENEGADE CRAFT FAIR!!!!! This is such an honor and I'm so so so excited!! 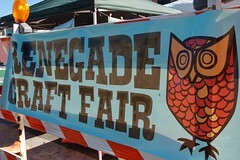 The Renegade Craft Fair is one of, if not THE top notch of crafty fairs out there. RCF has been in the works for six year now, but this is the first year it's going to be in Los Angeles. I'm so stoked! Come visit if you plan on going ! yay!! In "Art Shows", "California", "Craft shows", "Los Angeles", "buy jewelry", "cherryrunway", "excitement", "oppertunity", "opptimism", "renegade craft fair", "stellar", "stoked"